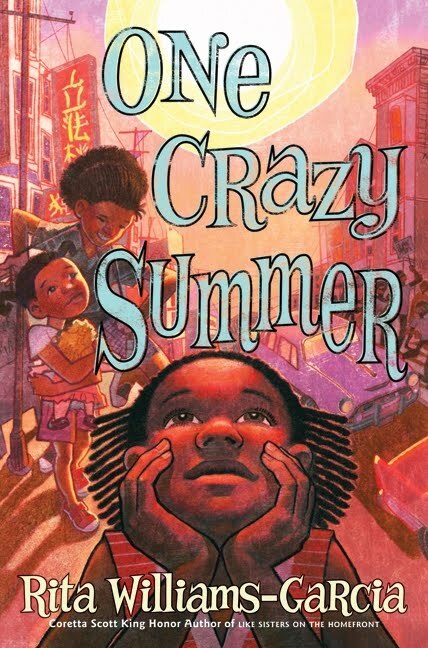 One Crazy Summer by Rita Williams-Garcia It's 1968, three sisters, 11-year-old Delphine, 9-year-old Vonetta and 7-year-old Fern will be spending the summer with their mother in Oakland, CA. They live in Brooklyn, NY, their dad and grandmother, Big Ma. Their dad decided it was time they got to know their mother. I loved these girls voices. They rang true and familiar. The sisters call their mother by her first name, Cecile. She left right after Fern was born. The girls quickly realize they will have to keep themselves occupied for the summer. Cecile is a poet and not maternal. The kitchen is her workspace and it's off limits to the girls. At night they eat takeout on the living room floor. In the mornings, the sisters go to the People's Center, for the free breakfast provided by the Black Panther's. They stay for the program, which is taught by Sister Mukumbu. The author gives glimpses into lessons being taught at the center, though it's really from the girls' actions that we understand the impact the Black Panthers have on them. The sisters attend the summer program throughout their stay in Oakland. At the end of the summer, the Black Panthers have a rally in the park for 17-year-old Bobby Hutton. He was the first member of the Black Panthers and was shot down in his underwear, while trying to surrender. The Panthers want the park to be named in his honor. The children of the summer program are allowed to participate. The sisters decide to recite one of Cecile's poems. It's a beautiful poem, that I've read several times. It reminds me of Nikki Giovanni's "Ego Tripping." If I had to guess, I'd say Williams-Garcia spent time with these sisters before she let them out in the world. Their relationship is natural and believable. Though it's Delphine voice, we hear most often, the author gives each girl a distinct personality. I smiled my way though this book. It's filled with an honesty I love to see in middle grade fiction. The sisters are simply beautiful. There isn't much middle grade historical fiction featuring Black characters that at some parts warm your heart making you laugh out loud, then just as quickly teaches something. I wish this book was around when I was younger, I would've swallowed it whole. The Black Panthers are a very important part of history, but they've been ignored until this year's release of The Rock and The River by Kekla Magoon and soon One Crazy Summer. It's inevitable that these two novels will be compared. I think it would be best if they were simply paired. Though both books are about the Black Panthers, the authors' approaches are different. There is no better, just another way. One Crazy Summer scheduled release date is January 26. I highly recommend pre-ordering it right now. Ages 9 up. While you wait if you haven't already, check out the above mentioned The Rock and The River by Magoon or Williams- Garcia's recent YA release Jumped, which is a National Book Award finalist this year. This sounds wonderful, especially since you say it resonates so much with you. I have Jumped in my car, I'll have to move that to the top of my list after reading this review! Thanks everyone. I love the voices of these three little girls. One thing I didn't mention - there is a Jacqueline Woodson blurb on the back of the book. Woodson doesn't blurb books all willy nilly. She rarely does it. Wow, a blurb from Jacqueline Woodson...it must be fantastic then. Just read this. Love, love, love. The girls are fabulous, I even love Cecile.